2000 - World leaders promise to deliver free, primary education for all children by 2015. 110 million children are missing out on school. Charities and teaching unions come together to set up the Global Campaign for Education. 2004 - World's Biggest Lobby. 2.5 million campaigners, young and old, target heads of state, dignitaries and officials in the ‘World’s Biggest Ever Lobby’. 2005 - Send My Friend to School launch. 7,000 schools take part in the first Send My Friend to School activities. Five million ‘buddies’ – each representing one of the 100 million children out of school – are sent to world leaders. 2006 - My Friend Needs a Teacher. Over six million campaigners in 112 countries highlight the global teacher shortage. 8,000 UK schools take part. UK government promises to give £8.5 billion for education worldwide by 2015. 2008 - World's Biggest Lesson. An amazing 8.8 million people worldwide take part in the World's Biggest Lesson. 250,000 children in the UK send decorated Missing Out cards to Gordon Brown asking him to prioritise education at the G8 meeting. The G8 announce $1 billion in funding to help meet the global shortfall for education. Sadly, this is less than 10% of what they need to give. 2010 - 1GOAL. 72 million children are still out of school. The international 1GOAL campaign focuses the huge attention paid to the World Cup on the need for education for all. This was the first time that the World Cup was hosted by an African nation, in South Africa. And a global petition signed by 18 million people. A million young people join in with 1GOAL in the UK. All this helped secure big funding pledges from world leaders to help deliver education for all. 2011 - Send My Sister to School. 67 million children are still out of school, and girls are more likely to miss out. More than 600,000 young people take part in Send My Sister to School in the UK, reaching 98% of MPs with their 'sister' messages. The UK government sets up a Girls Education Challenge Fund with £344 million to help over 650,000 girls access primary and secondary education. 2012 - Go for Gold. Progress is stalled, with 67 million children still missing out on school. In the London Olympic year, young people in the UK created gold medal artwork messages, calling on world leaders to ‘Go for Gold!’ for education. Here young campaigners meet DFID Minister, Stephen O'Brien MP at Westminster. 2013 - My Friend Needs a Teacher. In 2013, young people all around the world reminded their leaders that every child needs a teacher and drew attention towards a global teacher shortage of 1.7 million teachers. Here, young campaigners from Wales meet the Prime Minister, David Cameron to ask for his help. 2014 - Send ALL My Friends to School. Ade Adepitan went back to school as part of our 2014 campaign which saw 500,000 young people speak up on behalf of millions of children with disabilities around the world who are missing out on the education that is their right. 2015 - Send My Friend to School. Hundreds of thousands of you spoke up in advance of the UN summit, asking world leaders to make education a priority in the new global goals. Luckily they were listening! A Sustainable Development Goal to give every child an education by 2030 was agreed. This new goal pledges that every child will receive both a primary and secondary education. 2016 - Send My Friend to School. More than 4,000 schools take part in campaigning making paper rucksacks to symbolise the journeys made by children around the world. Globally more children than ever before have had to flee their homes and schools due to conflict, natural disaster and health crises. World leaders respond with a new fund: Education Cannot Wait. The UK government leads the pledges with £30 million announced. Lots more funding and global leadership is now needed to help tens of millions of children affected by emergencies who are missing out on school. World leaders promise to deliver free, primary education for all children by 2015. 110 million children are missing out on school. Charities and teaching unions come together to set up the Global Campaign for Education. 2.5 million campaigners, young and old, target heads of state, dignitaries and officials in the ‘World’s Biggest Ever Lobby’. 7,000 schools take part in the first Send My Friend to School activities. Five million ‘buddies’ – each representing one of the 100 million children out of school – are sent to world leaders. The Make Poverty History campaign runs throughout the year. At the G8 in June, world leaders promise to cancel debts owed by 18 of the poorest countries and give more money for education. 8,000 UK schools take part in My Friend Needs a Teacher and make cut-out teachers. Over six million campaigners in 112 countries highlight the global teacher shortage. The UK government promises to give £8.5 billion for education worldwide by 2015. Over a million children in 120 countries around the world JOIN UP in human or paper chains. Children from 11 countries go to the European Parliament, to make the first JOIN UP chain, and in the UK, school children visited Prime Minister Gordon Brown to ask him to take action on education for all. 250,000 children in the UK send decorated Missing Out cards to Gordon Brown asking him to prioritise education at the G8 meeting. An amazing 8.8 million people worldwide take part in the World’s Biggest Lesson including thousands of students in the UK. World leaders meet in July in Hokkaido, Tokyo in Japan. The G8 announce $1 billion in funding to help meet the global shortfall for education. Sadly, this is less than 10% of what they need to give. A million young people take part in the Big Read in the UK, listening to the words of Nelson Mandela, Michael Morpurgo and other writers on the importance of literacy before holding their own read-and-write-athons, and asking the Prime Minister to do all he can to give every child a chance to go to school. 13 million join in around the world! 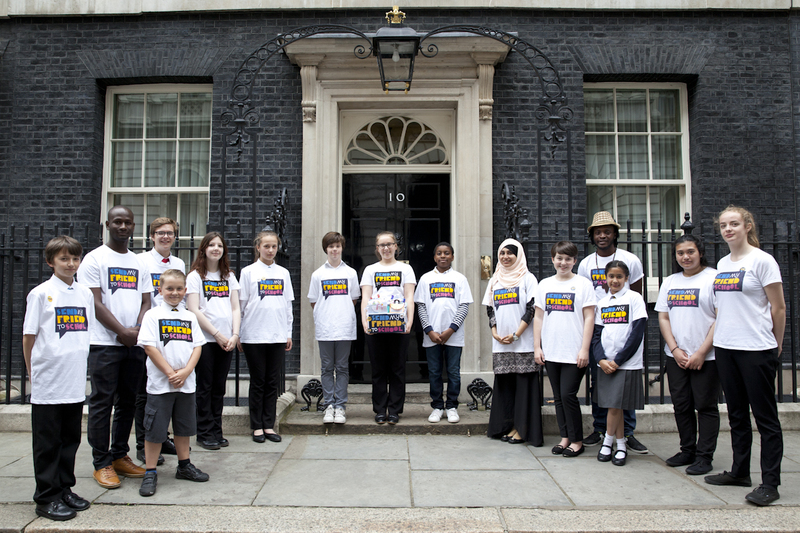 Young campaigners Lily and Jenade visit Downing Street to interview the Prime Minister about education for all. Video: Lily and Jenade interview party leaders. With five years to go until 2015, 72 million children are still out of school. The international 1GOAL campaign focuses the huge attention paid to the World Cup on the need for education for all. A million young people join in with 1GOAL in the UK, sending thousands of giant supporter scarves to the Prime Minister. Football icon Gary Lineker, and wife Danielle, attend the Parliamentary launch of the campaign with Global Education Young Ambassadors Ronan and Rhiannon. 67 million children are still out of school, and girls are more likely to miss out. More than 600,000 young people take part in Send My Sister to School, sending ‘sister’ messages to their MPs, and a parliamentary exhibition takes the children’s messages right to the heart of government. Progress is stalled, with 67 million children still missing out on school. In the London Olympic year, young people in the UK created gold medal artwork messages, calling on world leaders to ‘Go for Gold!’ for education. See the GCE Annual Review 2012 for more. With over 60 million children still out of school, another 1.7 million teachers are needed to deliver education for all. More than a third of children missing out on school have a disability. Half a million children across the UK take part in our campaign to ask for ALL children to go to school. The UK government pledges £300m for global education. Half a million children sent world leader messages to their MPs. And when world leaders will met in September at the UN they agreed a new goal to ensure that every child receives a quality education up to the age of 15 years old. Young people from 4000 schools across the UK create paper rucksacks depicting what they would take with them in an emergency situation to call for world leaders to take action to ensure education for children caught up in emergencies. The UK Government pledged £30million to a new Education Cannot Wait fund. 300,000 children and young people from across the UK created paper puzzle pieces to show that financing is the missing piece in the education puzzle. Together we called for the UK Government to pledge to the Global Partnership for Education – they pledged £225 million. A quarter of a million young people join our Make Schools Safe campaign to call on the UK Government to sign the Safe Schools Declaration – which they do in April 2018! Together, we continue to push to ensure the Declaration is implemented. Photos: Kate Holt/Shoot The Earth/ActionAid, Chryssa Panoussiadou/ActionAid, Mark Chilvers/ActionAid, Camille Shah. The ‘Transforming Education for Girls Project’ is run by Maarifa ni Ufunguo in Tanzania, supported by ActionAid and funded by Comic Relief and the Tubney Charitable Trust.